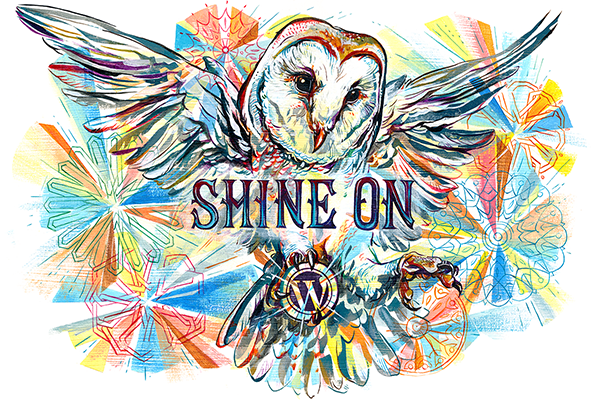 #15 Learn 15 New Things: Women’s Roller Derby! There’s no arguing that Women’s Roller Derby is one of the toughest, most fast-paced contact sports around. I’ve seen the Minnesota Roller Girls a few times and they always keep me on the edge of my seat. The skaters are tough as nails and out to kill. Today I saw a Facebook post by my old favorite team and I felt inspired to learn more about the sport. As much as I’ve enjoyed watching derby and admiring those who play it, I admit I understand little about the rules of the game. Women’s Flat Track Roller Derby is played by two teams of 5 skaters, flying at lightning speed in a pack around a track. The players fight to earn points and knock other players out of the ring. The matches are called bouts and they consist of two 30 minute periods, which are broken up into numerous jams. 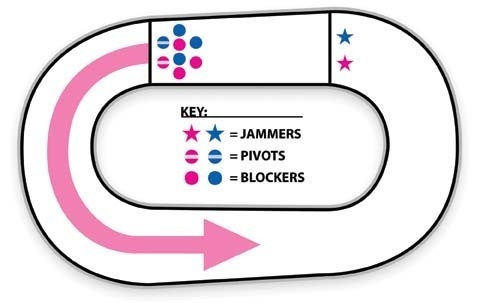 Each team consists of 3 blockers, 1 jammer, and 1 pivot. The jammer starts in back and score points by lapping members of the opposing team. The teams play both offense and defense at once; they help their own jammer while hindering the other team’s jammer. Each jam can last up to 2 minutes, and each team scores points according to how many scoring passes their jammer made (every pass a jammer makes through the pack after the first one). The blockers use body contact, positioning, and other tactics to assist their jammer and hinder the other. The pivot is a blocker that can becomes a jammer if necessary. 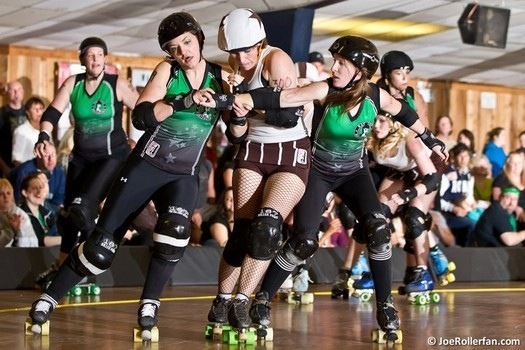 There are a few teams in every major city across the US these days, and US roller derby leagues represent about half of the 1250 leagues registered worldwide. Chicago has at least two leagues that I know about and each league is made up of at least 4 or 5 teams. The Windy City Rollers were founded in 2004 and the Outfit (an all-traveling league) in 2007. I can’t wait to get out and watch these ladies tear up the track! According to Wikipedia, roller derby has evolved greatly over the years. While the sport has its origins in the banked-track roller skating marathons of the 1930s, Leo Seltzer and Damon Runyon are credited with the basic evolution of the sport to its initial competitive form. Professional roller derby quickly became popular; in 1940 more than 5 million spectators watched in about 50 US cities. In the ensuing decades, however, it predominantly became a form of sports entertainment where the theatrical elements overshadowed the athleticism. This gratuitous showmanship largely ended with the sport’s contemporary grassroots revival in the first decade of the 21st century. Although some sports entertainment qualities such as player pseudonyms and colorful uniforms were retained, scripted bouts with predetermined winners were abandoned. 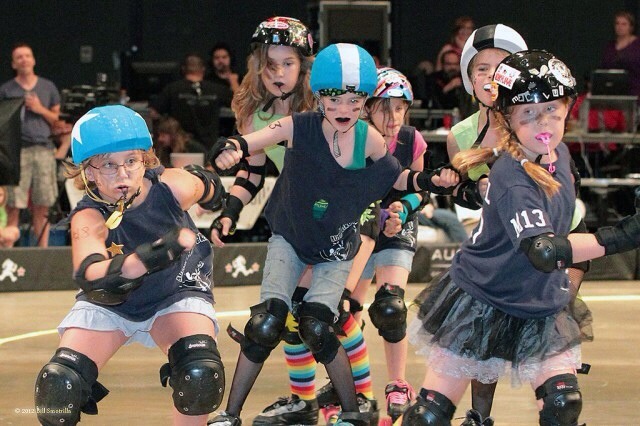 Roller Derby has also been taken over by young’uns! In Chicago, as well as Austin, TX, and a number of other major US cities, there are now roller derby leagues for kids age 7-17! In Chicago the Outfit is a parent team of the Chicago Riots, just that type of league! 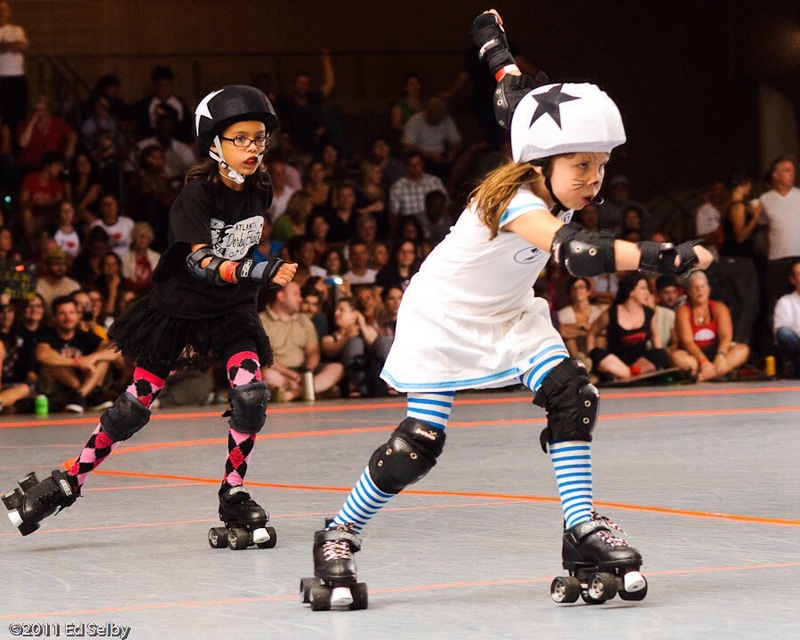 Watching youth derby – even videos online – really does a number on your emotions; you’re drawn in because those kids are absolutely adorable, but then you keep watching because they’re some badass little brats who know how to throw down. If I were a kid I would love the idea of slamming other kids around on roller skates! Here’s to creating a whole new generation of tough chicks! Wow, cool! Did not know any of this. Enjoy!